Name the stitches used in this block for the flowers,stem and leaves. 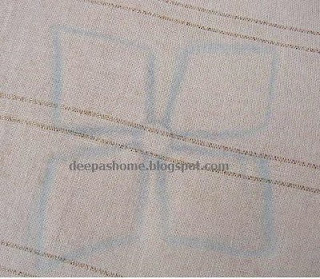 BTW I saw the full view of the bed linen.. it is really a good one. Okay... I'll play along... and I'm guessing from the top of my head and not consulting any book.... I'd say, detached blanket on the flower, herringbone (could be fly) for the leaves, and chain for the stem... maybe I need to put my glasses on, heh heh! Hope to see some other guesses. Anu... great guessing..you're 80% right :) Missed the second flower. Aaackkk...how dumb of me ;) But I changed the name of the file. Now let us see. But you got only that one stitch right. 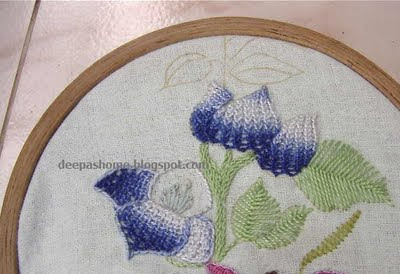 Yes, one of the flowers is done with a brazilian stitch. But no fly stitch has been used.